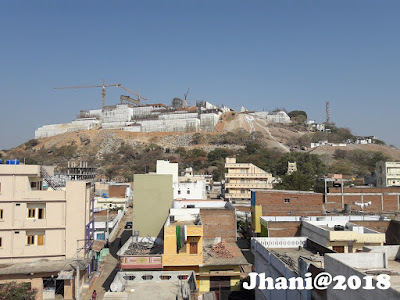 Bhongir fort is located in Bhongir Town on NH202 (Hyderabad-Warangal Highway) of Nalgonda district and is 51-kms away from Hyderabad and just 14 KM from Yadagirigutta. It was constructed on a single rock on the hill of Bhongir, 609.6m above sea level and spreading over 40 acres of area. It is believed that the western Chalukya ruler Tribhuvanamalla Vikramaditya VI got the fort at this place constructed in the 11th century AD, which was named after him as Tribhuvanagiri. The name subsequently became Bhuvanagiri and Bhongir. The fort is also associated with the rule of the heroic queen 'Rudramadevi' and her grandson 'Prataparudra'. The Chalukyan style of sculpture is distinctive, and was further refined by their successors, the Kakatiyas, Bahamanis and Nizams. The fort was well secured against enemy attack, The majestic fort stands testimony to the artistic skill and sculptural prowess of those times of glory despite its current dilapidated state. The ruins are a unique combination of the Hindu and Islamic / Sarcenic culture with as many sculpted figures as there are arches. Content Source : various internet sites. Planning for Marriage in Yadagirigutta, i searched online procedure but unable to find , Can you please explain exact details. Manohar Rao, as per my knowledge it was closed due to legal issues... not sure about is it restarted or not... kindly check with temple authorities.